$350 off MacBooks, Anker’s newest wall charger, and your choice of discounted dash cams lead off Wednesday’s best deals. We see deals on 12" Apple MacBooks on Amazon and Woot from time to time, but they’re always for refurbs, and always older models. Today though, Amazon’s taking $350 off brand new laptops from the current generation (released in the middle of 2017). Your only choice here is the color - each one includes the base Core M3 processor, 256GB SSD, and 8 GB of RAM. It’s not a powerhouse, but as someone who has one of these from work, I can tell you that it’s terrific for travel. It’s light, I can charge it with a USB-C battery pack, and it fully opens on an economy tray table. It’s been nearly a year since the first Qi-compatible iPhones were released, and wireless charging pads are still flying off the shelves. Today, you can score Anker’s 10W model for $15 with promo code ANKER253. Want to catch package thieves (especially inept ones) in the act? Or just see who’s at the door so you know whether it’s worth getting off the couch? The Ring Video Doorbell 2 is $30 off on Woot today, and will give you an instant alert when someone’s walking up to your door, and even record the footage to the cloud with a subscription. You know those fancy Bluetooth earbuds you love using so much? Surprise: they won’t work with your Nintendo Switch, or the seatback TV screen on a plane. But for just $22 (with promo code KINJA070), you can plug this Bluetooth dongle into any headphone jack, and connect to it with your favorite wireless headphones for wireless listening. It even has AptX codex support for lower latency. With clicky blue switches, this HyperX mechanical keyboard might not make you popular in the office, but it’ll feel like a dream to type on. For an all-time low $80, it also includes a variety of lighting effects and a steel frame for maximum stability. Anker’s newest PowerPort wall charger is its smallest one yet, and you can save a couple bucks at launch today with promo code ANKER262. Mesh routers are so hot right now, and Linksys’ take on the concept is about $20-$50 off its usual price for a 3-pack today. $25 is a great price for a USB-C wall charger with a 46W Power Delivery port, which is enough power to charge a MacBook Pro or Nintendo Switch in handheld mode. But it’s especially great when you consider that it includes an extra USB port for your phone or tablet as well, making it ideal for travel. Just be sure to use promo code AUKEYYA1 at checkout to save.Get it for just $7 with promo code 5P28FO9V. The Kindle Paperwhite is the best e-reader for almost everyone, and at $75 for a refurb, it’s within $5 of the best price we’ve ever seen today. And don’t worry, you’ll still get the same 1-year warranty you’d get if you bought it new. If you love inky blacks and vibrant colors—and who doesn’t?—this 55" 2017 OLED LG TV is down to $1149 today at Walmart as a refurb, or an all-time low $1590 for 65", with small additional discounts available if you pick up in a store. $52 gets you RAVPower’s 26,800mAh battery pack, complete with a 30W USB-C port that can power a MacBook or Nintendo Switch at basically full speed, plus two regular USB ports as well. Just use promo code 2XRA4PGQ at checkout to save a whopping $30. Anker’s nylon-wrapped, kevlar-reinforced PowerLine+ cables look great and feel great to use, and they’re running a big sale this week on USB-C version. Take your pick of a USB-A-to-C cable in two different lengths and two different colors, or a Power Delivery-capable C-to-C cable. Just be sure to note the promo codes. $1298 would be a solid price for a barebones 75" 4K TV, but this Vizio is anything but. With Dolby Vision HDR, 32 local dimming zones, and an array of smart apps, it has just about every feature you could want. Apple hasn’t updated the iPad Mini 4 in a few years, but if you don’t need the latest and greatest processor, and you prefer the smaller footprint, Walmart’s taking $100 off the 128GB model today, the best price we’ve ever seen. Or, for $50 more, you can opt for the 9.7" iPad fifth generation with the same amount of storage, and a processor that’s one year newer. It’s priced at $80 below its original MSRP, though unlike the iPad Mini, there is a newer model available. Bose’s wireless QuietComfort 35 noise-cancelling over-ears are basically a mute button for the rest of the world, and you can get them for $299 today, down from the usual $329. In addition to amazing sound quality and noise cancelation, they even work with Google Assistant, and as of a firmware update last week, Alexa too. If you prefer in-ear headphones, the Bose QuietControl 30 Bluetooth earbuds are also on sale for $249, or $50 less than usual. Those are the best deals we’ve ever seen on these! 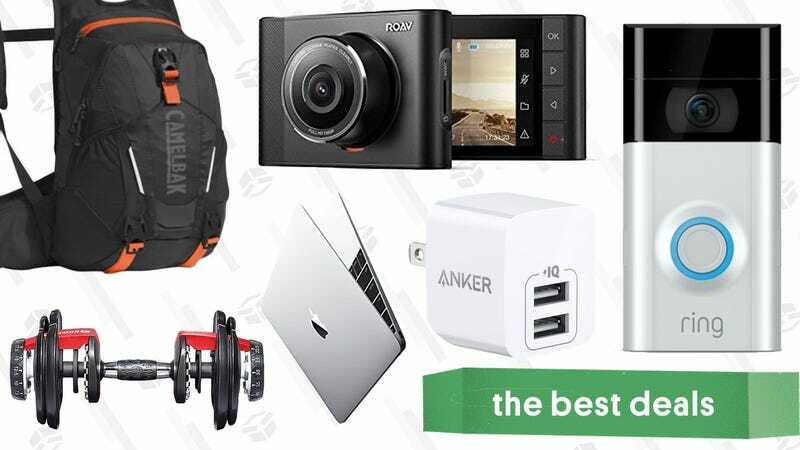 Anker has quietly built up an impressive array of automotive accessories, and several of them are on sale today only in Amazon’s Gold Box. Three of the four products in the sale are dash cams. In terms of specs, the A1 and C1 are nearly identical, but the A1 has a wider range of operating temperatures, and is actually $11 cheaper. Its design, however, is a little bulkier. I have the C1, and it’s completely hidden from my view while driving by the rear view mirror. For a bit more, you can upgrade to the C2 Pro, which includes a better low light sensor, built-in GPS, and comes with a 32GB microSD card in the box. Changing gears, the last item in the sale is a Bluetooth receiver that plugs into your car’s AUX jack, allowing you to wirelessly stream audio to older stereos. My wife has this one, and it works great. While not as wide-ranging as yesterday’s sitewide sale, today’s 20% eBay discount actually offers better savings, if the product you’re buying is sold by one of over 100 select sellers (listed at the bottom of this page). If you’re traveling abroad with an entire family, you probably shouldn’t trust your children to keep track of their own passports. Instead, grab this water resistant, zip-up wallet for $20 with promo code L46JM7Z6; it has space for six passports, plus a bunch of cards, so you can keep everything in one place. Just don’t lose it. It even includes some RFID-blocking sleeves and a micro travel pen for documents, as an added bonus. While it lacks the brand recognition of a Roomba, this ECOVACS N79S vacuum is the follow-up to the well-reviewed N79, its main addition being Alexa support. That means in addition to setting schedules and controlling the vacuum with your phone, you can now shout into the void that you’d like your floor vacuumed, and some combination of AI, voice recognition, and robotics will work in unison to make it happen. What a world. Just use promo code 9OPVPMN2 at checkout to save $50, bringing it down to the best price we’ve ever seen. Mason jar glasses are very trendy right now, and you can pretend like you’re always at an expensive brunch with this 8-glass set for $10, complete with handles. They work with standard mason jar lids too, so you can use them for storage when you aren’t using them for drinking. What should your next purchase be after buying mason jar glasses? Edison-style light bulbs, obviously. Get four of them for $10 with promo code KINJABULBS. Unless you live in Arizona or on the moon, you probably don’t want a humidifier right now. But in just a few short months, dry winter air will blow in, and you’ll be glad you bought one of these models from TaoTronics while they were on sale. Both can optionally be used with essential oils as well, to make your room smell nicer. Despite the proliferation of affordable smart outlet switches over the past couple of years, we haven’t seen many weatherproof options yet, and we’ve seen even fewer models with multiple outlets that can be controlled separately. This $25 option from iClever though has both of those features, and can be controlled with your phone, your voice assistant, or even IFTTT. Just be sure to use promo code WIFIPLUG23 at checkout to save a few bucks. While it won’t keep ice frozen for a week like more expensive coolers, this 70 quart Coleman will keep a lot of drinks cold for at least a day, and Walmart’s offering a terrific deal on it today. For $45, you’ll get the cooler and two Ozark Trail 30 ounce tumblers that can keep drinks cold all day long. The cooler by itself is currently selling for $43, so you’re basically getting those tumblers for less than $1 each, which is a complete no-brainer. If your favorite shower products don’t come in travel sized bottles, these reusable silicone bottles are the solution. Use promo code 8HKZFFUT at checkout to get a set of four for just $4. If you have any fall travel plans, or just feel like making some new ones on a whim, JetBlue is currently taking 20% off award flights from September 17-November 6, when you book with points by this Wednesday. The deal isn’t valid for Friday or Sunday travel, but otherwise, it should work on any JetBlue flight during the promotional window. JetBlue’s search tool will show you the discounted rated by default, so you won’t have to go through to checkout to see how many points you need. Don’t have enough TrueBlue points in your account to take advantage? It just so happens that Chase just added JetBlue as a transfer partner, so it should be really easy Sapphire Reserve and Preferred cardholders to top up their accounts. As we wrote here, transferring points doesn’t usually make sense, but you’ll definitely come out ahead with these discounted redemption rates. $65 is a solid $12-$15 less than usual, and an all-time low, so don’t sleep on it. Summer’s not over yet, and you can take full advantage with Walmart’s massive patio clearance sale. Grills, storage boxes, and lots of patio furniture are included, most with free shipping available. Beyond the standard $50 discounts you hear about in the middle of every podcast, Casper mattresses don’t go on sale often, and Casper accessory deals are even rarer. But this weekend only, Casper’s 10% Labor Day sitewide saleholds the promise of serious savings, if you still haven’t gotten rid of that old coil spring. To get this deal, you have to buy a mattress (sorry, dog mattresses don’t count), so you can’t take advantage if you’re only shopping for accessories. But 10% savings on a standard Casper mattress works out to nearly $100 on a queen, or as much as $240 on the new, advanced Wave mattress. Just use promo code SLUMBER10 at checkout to see the savings stack up. School is starting soon (or has already begun for some), so maybe it’s time to take stock in your kids’ wardrobes. Whether your they needs to wear a uniform every day, or you just need to restock on some basics to get them through the week, this Lands’ End sale from Amazon has polos, leggings, even a few backpacks thrown in as well. Thousands of our readers have bought Bowflex’s adjustable SelectTech dumbbells, and you can put them in your own home gym today for $249. At this point, it’s continuously warm enough to hike (though sometimes a little too warm), and Marmot is thinking about getting you geared up and outside for less. Right now, Marmot is taking 25% off sitewide with the code SAVE25 in celebration if Labor Day, aka the unofficial last weekend of summer. Plan your next camping trip accordingly. If you don’t know about Dallas-based Breda, you need to. The watch brand creates minimalist, easy-to-wear styles of watches that aren’t overworked or over priced. And we’ve got an exclusive discount for you. Use the code B2S50 and grab select watches for just $50. I wore my Sunski Dipseas everyday for over a year and got compliments on them practically every time. Sunski sunglasses are lightweight, comfortable, scratch-resistant, and 25% off right now. Pick up a pair that you’ll actually enjoy wearing. Whether you’re using them at home or on the road, this resistance band set lets you get a full workout basically anywhere, and at an all-time low $12, it’s quite a bit more cost-effective than joining a gym. Need an inexpensive new set of sneakers? Several options from Fila are on clearance today at Walmart, for both men and women. David Archy might not be a household name yet, but they sell some of the most popular underwear and clothing basics on Amazon, and a whole bunch of it is on sale today. You’ll find several different cuts here to fit your preferences, many in your choice of either soft and warm bamboo fiber, or light and airy micro modal. Plus, grab an extra 20% off any one outlet item with the code OUTLET20. Not only is Backcountry giving you up to 50% off a ton of clothing, gear, and accessories from brands like Patagonia, The North Face, Marmot, and more, there’s also an additional 20% off insulation gear from Columbia and Mountain Hardware, plus you can grab 30% off any full-price Arc’teryx item with the code ARCTERYX30. Phew, that was a lot to get out at once. The Office, an excellent Jack Ryan prequel show, is on Netflix at the moment, but there’s no guarantee that will always be the case. If you’d prefer to own it outright, Amazon’s running a Dundie Award-winning deal today. Every season of the show is priced at just $5 for Prime members. You won’t see that price on this page; you’ll have to click through to the individual season while you’re signed into a Prime account. My boss told me if we sell enough seasons, I’ll get to deliver a Mussolini speech at the next company meeting. If you’re looking to expand your programming knowledge, this Humble Bundle is for you. They have books on programming and theory for machine learning. As usual, they’re split among three different price tiers, and you can get them all for as little as $15. The book doesn’t come out until November, but you can preorder it today for $24, or $16 off. Plus, if it gets any cheaper between now and release day, you’ll automatically get the best price. Amazon Prime’s 20% video game preorder discount is no more, may it rest in peace. But it’s been replaced by $10 Amazon credit on select video games, and now, we know which ones. Bookmark this page so you can find more eligible games as they add them. It’s actually not all bad news! For example, FIFA 19 has only ever been available to preorder as a digital download, meaning it was never eligible for the 20% discount. But if you have Prime, it is eligible for the $10 credit. However, the physical copy of Super Smash Bros. Ultimate is eligible for the $10, but the digital download is not. You’ll want to scroll down on each game’s page to make sure this language is present in the “special offers and product promotions section.” This was taken from the Smash page, and as written, it seems like it should work on the digital download, but once you actually switch over to the digital version’s product page, this bullet point disappears. You might have missed Snipperclips when the Switch launched—Breath of the Wild had that effect on a lot of us—but it’s worth finding a friend and downloading a copy for just $14. Board games, when translated well, can make for really great video games, and a bunch of digital tabletop adaptations are included in the latest Humble Bundle. If you do nothing else, at least spend $1 to get Ticket to Ride on Steam and Android, but if you pay more, you can get the likes of Carcassonne, Talisman, and Armello too. Update: The deals below are still available, and now, Splatoon 2, Donkey Kong Country: Tropical Freeze, Kirby Star Allies, Captain Toad: Treasure Tracker, and Minecraft have joined them. If you have any notable holes in your Nintendo Switch game library, you can fill them today with rare discounts on first party Nintendo games. Breath of the Wild, Super Mario Odyssey, Mario Kart 8 Deluxe, and Mario Tennis Aces are all marked down to $45. Still need a Switch? The best deal running right now is the console plus the Labo kit of your choice for $339, a savings of up to $40.